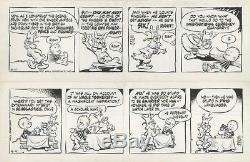 Two (2) Pogo strips by Walt Kelly! Published on April 7th & 9th, 1965. Featuring Pogo and Howland Owl! This is the original artwork, inked by Walt Kelly using a brush, for newspaper syndication on the days indicated. Each is in good condition, with some aging as shown in photos. Each is signed by brush by Mr. Kelly, within one of the last panels. Contact me with any questions or requests. The item "Pogo by Walt Kelly Original Daily Comic Strips 4/7/65, 4/9/65" is in sale since Saturday, November 17, 2018. This item is in the category "Collectibles\Comics\Original Comic Art\Comic Strip Art". The seller is "picassotrader" and is located in Santa Rosa, California. This item can be shipped to United States, all countries in Europe, Canada, Japan.